While I think the Bluffdale city council is a bunch of fools trying to stop a needed commuter rail station, I cannot condone the actions of the state legislature in trying to force the station on the city. The only thing the legislature is going to do is create resentment within the city. As I mentioned in the previous article, Bluffdale has their heads in the sand if they do not think growth is coming. Getting people on the commuter rail is going to help Bluffdale deal with the growth. If there was no station built in Bluffdale, I wonder how long it would be before they would be crying for it? After all, I remember Larry Miller saying that no would ride TRAX to his complex at Jordan Commons so he could care less about a station but look what happened just a few years later. A station would help Bluffdale, but the legislature should not be forcing down their throats. Monday was not a good day for TRAX passengers along the north-south rail line. Something apparently fell from Interstate 80 and damaged the wire that carries the power to the cars. It took many hours to fix the problem so here is my thoughts on the problems. First of all UTA did what it could at the beginning as they used the good track to turn the section of track into a single track line. The downside of this is because of the way the signaling system works the trains have to travel slower, but for the few times this has happens it is fine. There is a big rally cry that buses should have been called out immediately. That is all well and good but there is some practicalities that need to be taken into consideration. UTA doesn't have drivers standing around waiting for that one time in years that they need an to get buses to TRAX. It takes time to get the drivers together and put the buses into service. From reading the comments, some people act as though UTA should have drivers standing by in case that rare incident occurs and they have to use buses. Yet if UTA did have drivers standing around like that they would be attacking UTA for having drivers standing around doing nothing. What UTA could do better is on the communication side. 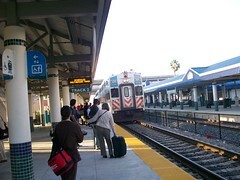 I was at the Sandy TRAX station when a guy committed suicide in front of the train at that station. Despite there being many UTA officials there, none of them told the passengers what was happening. While that incident was a few years ago, last year I was heading down to Utah County. I took the first 40 bus (now 45) over to the TRAX station. 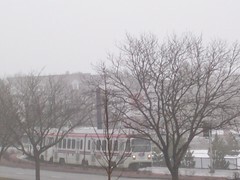 It turned out that there was a train of the UTDC cars broken down near the 3900 South Station. No trains were coming but no one said anything to the passengers. Even when a out of service train pulled in the operator didn't have the courtesy to tell the waiting passengers what was going on. Finally after about 30-minutes everything started moving. I was taking the first southbound train of the day to catch the 811 and thought I had missed it and was going to have to wait an half hour. However, UTA did communicate with the 811 driver and told her to wait for train to show up. So in that case they did do a good job communicating. Yes UTA can improve, but rare incidents are going to happen. UTA needs to be prepared but there is limits to what can be done. What they should work on first, is communication with waiting passengers so that they know what is happening and this includes reminding the operators that they are ambassadors for the transit system so when incidents happen they need to keep their customers informed and not hide behind the operators door. Here is a surprise to no one. 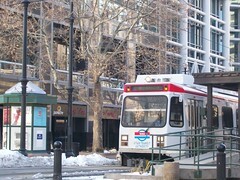 A House Panel has passed the bill that gives the state more control over the Utah Transit Authority. Once again the misguided efforts of the Anti-Hunger Coalition that sees the state as their savior is going to cost them in the long run. Just look at the two people who are pushing this bill. First you have Wayne Harper out of West Jordan (what is it about West Jordan? ), who has in years past tried over and over to have the state take over operation of UTA and thus steal the sales tax money approved for TRAX and move it to roads. The other person pushing this is Senator Sheldon Killpack who is also shown to be anti-transit and looking to raid the UTA of funds to give to highways (even though all the TRAX money would only be a drop in the bucket). Clearly neither of these two men have transit in their best interest. I am sure that once the raiding begins Bill Tibbets and his gang of yellow shirts from the Anti-Hunger Coalition will take none of the blame and wonder were the money has gone and scream up a storm. Once again as in the issue with the airport TRAX line, it is just amazing how it seems OK in this state for our state legislature to raid the funds of and reduce the power of local government, to take away the voting rights of citizens, and yet the people continue to vote for the clowns. Whatever happened to local control? The Deseret News has a copy of the article today talking about how our state Senate is trying to rein in on the city of Salt Lake and tell them how to spend their money. Isn't it interesting that Bramble the Senator from Provo who got this bill passed did not ban the airport from spending money on highways and parking which is were many of the dollars go to. Lawmakers are trying to keep Delta Air Lines happy, in an effort to keep the company's hub in Salt Lake City. Delta Air Lines officials don't want the airport improvement fund raided for light rail, and "I'm not aware of any other industry that is being asked to put a disproportionate share into light rail" said Rob Jolley, a lobbyist for the airline. "The banking industry hasn't been asked to do that, the real estate industry hasn't been asked to do that," Jolley said. Then, he sent a clear warning to lawmakers to keep Delta happy, or else. Isn't there something wrong that the Delta Airline's lobbyist is basically making threats to the state? So not only do we have the state dictating to Salt Lake on how to spend its money, but you also have a lobbyist for a major corporation telling the state to force a city to do something or else. If Bamble had any guts, and not just a puppet for this lobbyist he would be making sure that policy is set for what is best for the community, not the threats of a lobbyist. Rapid Streetcar for Davis County? In today's Deseret News there is an article about transit options in Davis county and it looks like the preferred option is going to be a rapid streetcar which is not as expensive as light rail but faster and longer than the streetcar lines I have talked about for the Salt Lake area. This idea makes good sense for the area. There is not a lot of room to build out a full blown TRAX line in the region, the line will already have commuter rail for longer trips so that leaves the rapid streetcar. This system will greatly increase the number of transit riders. 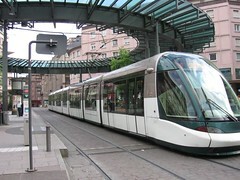 The picture is of a tram in Strasbourg. The line goes through the downtown area and goes through this central downtown plaza that has no auto traffic then connects a block with other streetcar lines. Once again the almighty state legislature is interfering in local decisions. The airport is owned and operated by the city not the state, but our state legislature continues to show they cannot be trusted when it comes to local decisions. Also let us not forget that these are the same people that Bill Tibbets and his gang of yellow shirts from the Anti-hunger coalition have made their bed with to gain more power within the UTA. Do you really think you can trust the state legislature???? Developers are donating land to cover the construction of the Mountainview Corridor. Notice that the land only includes the section from 9000 South to Redwood Road which is actually going to be one of the less expensive segments to purchase. Also they mention the proposed transit line but like several of the streetcar proposals has been downgraded from rail transit to bus service. Well it seems that our friends in Bluffdale still have their heads in the sand. Apparently they feel that if they just ignore the growth it will just magically not come to their little slice of paradise. Instead of doing things will help their residents, that will provide them freedom from having to drive every where that rather force all of their residents to drive and not have any options. A Frontrunner commuter rail stop would give the residents options they do not have now except for their extremely limited bus service. Clearly no matter how hard they try, growth is heading their way. It is better to deal with it, make some good planning decisions than just pretend it is not happening and think somehow it will pass you by. Here is a video from someone riding a Los Angeles Metrolink Train. Since our commuter trains will still be running I tried to find a video that showed what it is like to be on one of the trains for those who have more experience. Some things you will notice about the commuter trains is that they are quieter than TRAX even though they are hold by diesel locomotives. 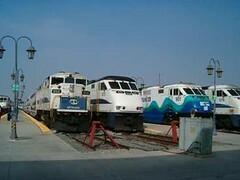 While you will get some swaying once in a while the ride is smoother than riding TRAX. 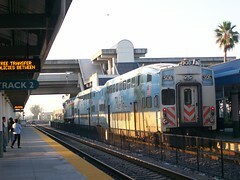 The Tri-level cars from Bombardier that are used by Metrolink are the same type that UTA has purchased (UTA has also purchased used cars from Chicago and New Jersey) only with different interiors. This second video is from the Interior of a Metrolink San Bernardino Line train which travels along the San Bernardino Freeway (Interstate 10) from El Monte to Cal State. 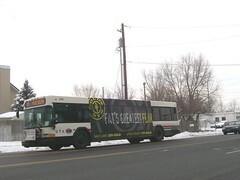 UTA is proposing bus changes in Davis/Weber Counties for Front Runner commuter service. I am surprised they are not making more changes but then again those counties don't have that much service anyway. However why are they not changing the 612, 613, 626, 627, 470 and other routes to service the commuter rail stations better? 604/610/640 in Roy-While I hate to see bus service routes cut, I think the changes will cover existing service the best way possible. I have ridden all these routes multiple times and the route changes do cover were the ridership is. The times I have ridden the outer ends of the 610 there was been 0 riders. The big problem here is that the route ends before the big development areas. Once everything settles down it would be nice to see a flex route cover the section of 5500 South out to the new developments and connect with the Commuter Rail route. Also the modifications to the 640 in the Clearfield area will eliminate some duplication but service the areas were the ridership is. Also don't be surprised if you see more cuts to 472 once FrontRunner is operating for a period of time. This would be a good time for UTA to add more service along the US 89 Corridor and connect into the FrontRunner at Farmington. Some have asked the question why should City Creek be designed to blend better in with the community. Some say it is not their responsibility to boost sales along Main Street and help the rest of downtown. While yes, they are not responsible for helping the rest of downtown, it is ironic that they would actually benefit by developing their center so it more integrates with the rest of downtown. What will City Creek add to the area that it does not already have? Well we do know the area is getting a Harmon's Grocery Store but that is actually separate from the rest of the complex. Beyond that what will set this place apart from say Fashion Place Mall or the new Cottonwood Center? Actually nothing. In my case if I want to shop at either of the two big retailers that will be in the center, I could do that at Fashion Place Mall. Most of the smaller stores in the center will be the typical chain stores found anywhere else including the new Cottonwood Center which is a half hour walk from my apartment. So what will draw me or someone like me to the center? Not much. Why should I fight traffic or take two buses just to get to a center that has nothing unique in it? It is ironic that Nordstrom's was also involved in the Riverpark Square in Spokane which is much like City Creek except it is enclosed. It suffers because it offers nothing that the suburban malls do not offer it people have little incentive to shop there unless you live in the downtown area or the immediate vicinity (which I did). Also notice in the design that the open space only opens up to the Church area to the north and a small section to 100 South. Beyond that there is little focus on the rest of downtown. Instead it is designed for people to drive into the center, do there shopping and leave the area and not share them with the rest of the area. In other words Gateway II. 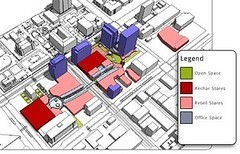 Now just imagine if the complex was designed so it flowed into the rest of downtown. People would be encouraged to walk around the area instead of shopping there and leaving. It would create new retail opportunities. It would give new life to the stores along Main Street. This would create new marketing dynamics. People would come to the area and spend more time. They would be encouraged to stroll the other streets and find unique shopping opportunities. It would give more reasons for people to travel to downtown. The City Creek project has the potential to greatly increase the marketability of the area, but not as it stands now. Mass Transit Magazine has an feature article on John Inglish. Inglish brags about how great the so called Bus Rapid Transit that is replacing regular service on 3500 South will be. Thank You to Orphan Road out of Seattle for referring to this article. The Cost of Paratransit Service. In the first part of this series I discuss what was done with the regular bus network in order to comply with the Americans with Disabilities Act. Now its time to discuss the other part of the puzzle, the Paratransit service called Flextrans here in Utah. Just a note: I am using numbers from UTA’s 2006 budget. So that no one could say the ridership numbers were too high, I cut the actual ridership numbers on TRAX by 20% but left the others alone. Of course the some would argue that UTA is padding the numbers but the numbers are in line with transit systems across the nation and the world. I also want to point out that I am NOT saying Flextrans is not needed, I am just pointing out the cost of the system compared to the rest of the transit system. So here are some numbers to think about. Looking at costs vs. passengers, TRAX cost $1.37 per passenger. So in other words TRAX is covering its above the rail expenses (meaning direct operating cost) and contributing to overhead. This makes TRAX the second most efficient light rail system getting beat only by San Diego. However, the numbers are in line with the other systems as they are very close with the exception of Los Angeles but that is another story. On the other hand, it cost $3.31 per passenger on the bus system. So not only is it not covering its direct operating cost, it is not contributing to overhead. This is one an area that UTA can improve since it is one of the more performing systems. Finally you have Paratransit service. It cost $24.95 per passenger for every passenger that boards the Paratransit service. To put this in perspective if UTA did not have to provide Paratransit service, bus service could be increased 17% percent overnight. In addition Paratransit handles only 4% of the numbers TRAX does and 2.5% of the bus system. So as you can see, what is costing the bus system is carrying the weight of the Paratransit service not TRAX. Now the ADA was designed to give those that needed it, equal access which is a good goal. However, wasn’t equal access created by putting wheelchair lifts or the creation of low floor buses? This gives everyone the same access to transit service to everyone. 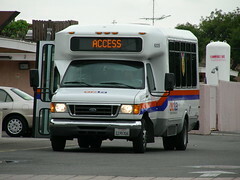 However, the requirement for Paratransit service creates special services that everyone else is not entitled to ride. Since Paratransit service is needed by those who use it, but is essentially a taxi cab social service, should the transit system budget be responsible to take care of it? Or should it be the responsibility of the social services agencies? We also know how the Paratransit passengers screamed when UTA started requiring them to pay more for there services than regular bus service (although the amount of difference has dwindled). Should Paratransit riders be expected to pay more for the premium service they require? Since the 307, 354 and others have one of the commuter cruisers being wasted on their routes, does that mean they will have the free wireless service also or do they not count because they are not traveling between counties? Hopefully this will be expanded to more routes in the near future especially TRAX. 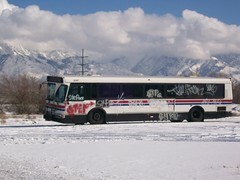 UTA Bus number 9347 sitting in UTA's boneyard having been tagged. Today I will begin a four part series on what is really costing the UTA. As regular readers will know, I have been critical of organizations such as the Anti-Hunger Coalition and the Transit Riders Union as they often become pawns of anti-transit forces and also demonize the rail program as being cause of all the problems. However, in this series I will point out the most costly program the UTA has to deal with and that is satisfying ADA requirements. Let me make it clear I am not trying to debate the needs of the ADA, I am point out what it cost to deal with it. In part one I will deal with the regular bus system, in part two I will discuss Flextrans and in part three I will go over the latest demands of the ADA, and fourth I will discuss some solutions. In the late 70's wheelchair lifts started appearing on buses. 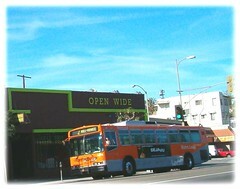 The SCRTD in Los Angeles was one of the first agencies to purchase them with their AMG buses in 1977. However, until the ADA took effect, most transit agencies avoided them. One of the problems with wheelchair lifts is that they can be extremely costly to operate and have been prone to multiple troubles. In addition the sidewalks need to be designed to be able to let the driver safely deploy the lift and everyone familiar with Salt Lake area sidewalks know they were not designed for that. As a solution to problem of the lifts the bus manufacturers started coming out with low floor buses such as the Gillig Advantage pictured operating on route 45. The idea of the low floor bus first came out with the Transbus program by the Federal Government in the late 70's. However most of the current bus manufacturers pulled out the program due to escalating cost, however when the ADA came along the bus manufacturers again started looking at the low floor buses. -Faster loading and unloading of passengers if the transit system takes advantage of them (which UTA has not except in the poorly design BRT scheme on 3500 South). There is other issues but those can be traced to poor build quality due to the transit systems not holding the manufacturers feet to the fire to build a better bus. In conclusion, transit systems lost capacity and faced increased cost to cooperate the ADA. However, the real cost is Paratransit and in the next part of series I will go over the cost of providing Paratransit (Flextrans) service. Once again Harper, a Republican from West Jordon is pushing a bill to change the make up of the UTA board. This is not the first time as he has tried to disband the UTA and make it part of UDOT on previous occasions. This time he is trying to change the UTA board so that the legislature and the governor would appoint the top three positions of the UTA board and politicians or their hacks will control the other positions. But Harper has an ally this time in the Anti-Hunger Coalition. Why are they supporting this? Apparently change for the sake of change. They are not looking at what the affects of the changes will be but it will show that they have actually done something and they desperately hope it will help their political agenda. However, Harper is not friend of transit. He like many of his fellow legislators are mad that the tax money that the VOTERS approved for transit is actually going to transit and they cannot steal to pay for their pet projects. As we saw in Los Angeles, the anti-transit forces will often use organizations such as the Anti-Hunger Coalition as pawns in order to advance their goals. If this passes, look for raids on the funds to build rail transit for other things such as highways because this bill puts the fox in charge of the hen house. Some of you may have seen an editorial published in the Los Angeles Times recently. It proves how well numbers can be manipulated for ones sake by just leaving out some important information. 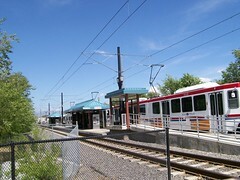 The editorial claimed that transit ridership declined in Los Angeles from 1986 to 2007 by 25% by using ridership numbers from the RTD which was the major transit system at the time to the today's METRO (RTD became METRO in 1994). The writers of the editorial one of whom was a consultant to the Bus Riders Union, claimed it was because the artificially low fares created by a proposition in 1980, ended in 1986 and all that money was transferred to rail construction. Looking at just those figures any smart person would say that rail construction caused a deep cut in ridership on the bus system. However, there is some convenient facts left out. The editorial compares the RTD ridership of 1986 to the Metro Ridership in 2007, seems fair right? Wrong. -All Express buses operating in the city of Los Angeles (a very large area) and several local routes are transferred from the RTD to the City of Los Angeled Department of Transportation to Operate. -Most routes in the San Gabriel and Pomona Valleys are transferred from the RTD to the new Foothill Transit Agency. -Many other routes are transferred to municipal operators. So in other words a large portion of the route structure of the then RTD and later METRO was transferred to other operations and this has continued. So in other words the METRO is operating substantially fewer routes than its predecessors the RTD did in 1986. In fact if you look at just the routes it operated in 1986 and that it still operates it would show a large increase in riders. So in other words, by just leaving out some important information, someone's political agenda is being met, but the public on the whole, if they read the editorial and took it at face value were being misled.